Tom Martin came on for the Astros in this April 1997 game with the bases loaded and the score tied. Facing Fred McGriff, Martin proceeded to throw four straight balls, walking in the winning run, The Associated Press wrote. "I thought I made a couple of decent pitches," Martin told The AP afterward, "but the calls didn't go my way." For Martin, those pitches were still among his first in the majors. He made the bigs days earlier after, starting out his ninth season as a pro. After that late start, Martin went on to pitch more than a decade in the majors. He finally through his last big league pitch in 2007 for the Rockies. Martin's career began in 1989, taken by the Orioles in the sixth round of the draft out of Bay High School in Panama City, Fla.
Martin played his first year between rookie Bluefield and short-season Erie. He made high-A High Desert in 1992. He then first made AA in 1994 at Greenville after moving to the Braves. 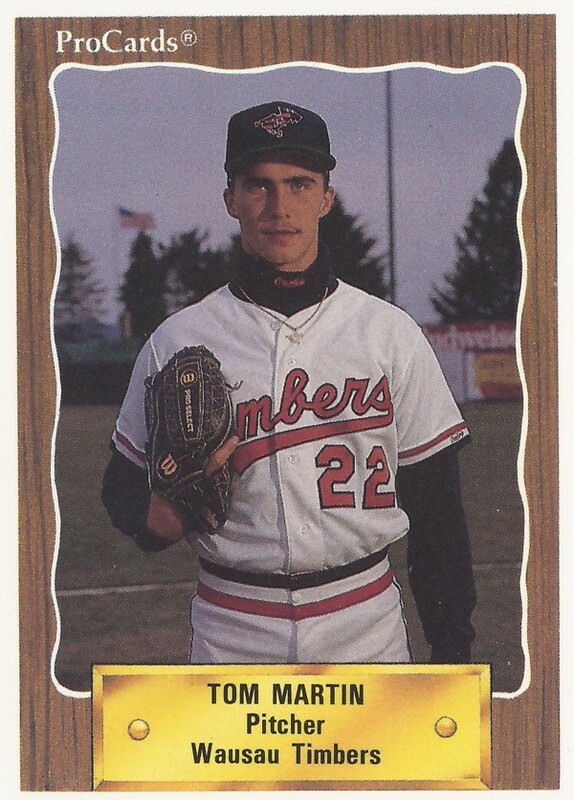 He then made AAA Richmond for 1995, where he pitched in seven games all year. Martin then moved to the Astros for 1996 playing mostly at AA Jackson, but also seeing time at AAA Tucson. For 1997, Martin made the big club in Houston out of spring training and he stayed up all year. He got into 55 games in relief, posting a 2.09 ERA. He even made the postseason roster. He played the next three seasons with the Indians, getting six outings there in 1999 and 31 in 2000. He then made the Mets for 2001, then the Devil Rays briefly in 2002. In 2003, Martin made the Dodgers. He also returned to his 1997 form. He got into 80 total outings that year, posting a 3.53 ERA. He then joined the Braves in mid-2004. "I'm going to be the guy to help the horses get out of jams," Martin told Morris News Service after arriving in Atlanta. "I think that's fun." Martin got into 29 games for the Braves down the stretch, posting a 3.71 ERA. He played in a shortened 2005, then played his final two seasons with the Rockies. He pitched in 68 games there in 2006, with a 5.07 ERA, then played his final year between Colorado and AAA Colorado Springs. "I'm slowing everything down," Martin told MLB.com after returning to Denver in August. "I've been keeping the ball down a lot more. My changeup is effective. All I have to do is just pitch." He pitched in a total of 26 games for Colorado that year, ending with a 4.91 ERA, concluding his career.